On Aug. 21, the moon’s shadow will roll across the U.S., as tens of millions of Americans witness a total solar eclipse. This is what you’ll be able to see in 14 states. Why do total eclipses occur? What will eclipse gazers see? It’s a gradual process, beginning with first contact—“when the sun and moon ‘touch,’” explains NASA heliophysicist Mitzi Adams. “This leads to the partial phase, when it looks like someone is taking increasingly large bites from the sun. Next is the actual eclipse itself, when the sun is totally covered by the moon.” All that is visible then is the solar corona, the sun’s gaseous halo, which peeks out from the blackness. Totality lasts from a few seconds to just over two minutes, depending on where you view it. The sun’s brightness in the totality falls by a factor of 1 million, temperatures plummet by as much as 20 degrees, and winds fall still. “Some animals react,” Adams says. “Cows may start walking toward the barn. Crickets start chirping.” Indeed, the sheer strangeness of eclipses has inspired fascination—and fear—since ancient times. What’s the timing of this eclipse? Beginning at 10:16 a.m. in Government Point, Ore., the eclipse will follow a 67-mile-wide path from Oregon through Idaho, Wyoming, Nebraska, Kansas, Iowa, Missouri, Illinois, Kentucky, Indiana, Tennessee, North Carolina, Georgia, and South Carolina—ending near Charleston at 2:48 p.m. 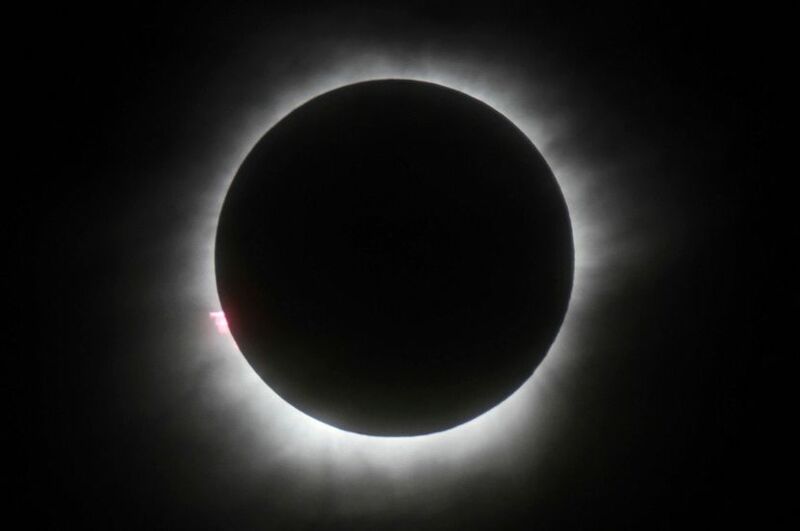 Some 75 million people live within a 200-mile drive of the totality path, and large crowds are expected to gather in towns and cities along the route, snarling traffic and straining infrastructure and emergency responders. To prepare, communities are coordinating with government, law enforcement, and food vendors, and ferrying in portable cellphone towers. Glendo, Wyo.—population 200—set up an airstrip viewing area to accommodate some 20,000 visitors. Eclipse watchers are advised to bring their own food and water and take appropriate safety precautions (see box). “The biggest shortage on the day will probably be port-a-potties,” predicts geographer Michael Zeiler. Will scientists learn anything from the eclipse?